Let’s hear it for girl power! This sweet G-rated sports-themed movie may be derivative but it offers real inspiration for young females who have no idea how difficult life used to be for women in general and women athletes in particular. It is 1971, a transitional time for young women who are discovering that the traditional roles of stay-at-home wife and mother are not their only options. One of these young women is attractive, well-educated, fashionable, married Cathy Rush (Carla Gugino). An accomplished athlete, Cathy aspires to be a college basketball coach, a career field that offers few choices for a novice. Cathy finally finds a small college in need of a basketball coach, or at least an “activities director” who is willing to work cheap. The college happens to be Immaculata, a small, quiet Catholic all-girls institution of higher learning that doubles as the Immaculate Heart of Mary nuns’ retirement home. The stern Mother Superior (Ellen Burstyn), more concerned about dampening the students’ hormones than developing athletic talent, is fighting an uphill battle to keep the school and the retirement home open. Without a proper gym, proper uniforms, or even a proper basketball, Cathy is determined to prove to everyone – especially herself – that she can mold a disparate group of girls into a real team. The only encouragement comes from Sister Sunday (Marley Shelton), soon recruited to be the assistant coach. Cathy’s efforts to employ modern coaching methods are met with intense disapproval from Mother Superior and the long hours she is willing to put in create tension with her NBA referee husband (David Boreanaz). The girls seem to be more interested in getting married and becoming traditional homemakers than polishing their basketball skills in their hideously outdated uniforms. Playing larger schools with established, well-funded athletic programs and plenty of family and school support, the Mighty Macs make a dismal showing in their first few games but Cathy doggedly persists and gradually things start to improve. Sister Sunday rallies the other sisters to provide much needed support and a cheering section for the team. Their “We Will Be #1!” buttons seem ridiculously optimistic, particularly considering that the school is on the verge of being closed permanently. With all of these obstacles to overcome, Cathy is more determined than ever to make the impossible happen. What they need is a miracle. The miracle comes in the form of a spectacular winning season and an invitation to the first ever national women’s basketball championship tournament. But with no money to send the team to the competition, can the little college claim the Cinderella title that they have worked so hard to achieve? 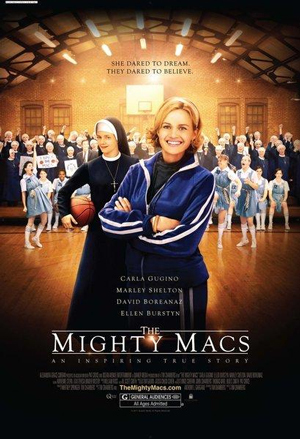 The Mighty Macs tells its classic underdog sports tale with a lot of tried-and-true clichés tossed in for good measure. The presence of so many nuns, while integral to the story, provides plenty of flashbacks to Sister Act. There aren’t many surprises as the film unfolds and some of the characters come across at times as entirely too one-dimensional. There are lines of dialog that are extremely corny. Still, despite all the familiarity (which can be forgiven considering the G rating), this movie has a lot going for it. With its heartwarming story and charming performances, the film is emotionally engaging and enthusiastically empowering. Knowing that the story is based on true events helps to elevate it from a forgettable yawner to an inspiring example of what women can achieve when they believe in themselves. This is a wonderful family movie for both tween girls and anyone interested in modern sports history. Cathy Rush not only coached the Mighty Macs to a winning season in 1972, she coached them to three consecutive national women’s basketball championships; she was inducted into the Naismith Memorial Basketball Hall of Fame; several of her players went on to become nationally recognized college basketball coaches as well. And the quiet little all-girls school became a co-ed university that continues to thrive. While this one may not find its footing in theaters, it should become a permanent fixture in home DVD/Blu-ray libraries where there are young children. Cosmic Twins rating: Cotton candy for everyone! This entry was posted in Movies and tagged basketball, Carla Gugino, Catholic, Cathy Rush, cinderella team, David Boreanaz, drama, Ellen Burstyn, family, Immaculate Heart of Mary, Marley Shelton, Mighty Macs, nuns, school, sports, women by S.D. McPhail. Bookmark the permalink.